S&L Non-Clog Pumps | Smith & Loveless Inc. Rugged S&L Non-Clog Pumps don't need design gimmicks to meet the 10 States Standard for 3" (7.6 cm) solids handling. With custom-trimmed dual-port impellers, we pass 3" (7.6 cm) solids and still maintain high efficiencies. And for high volumes of flushables, S&L's proven X-PELLER® mono-port impeller with a 3" (7.6 cm) passage gives you the longest clog-free pump life for the lowest costs. 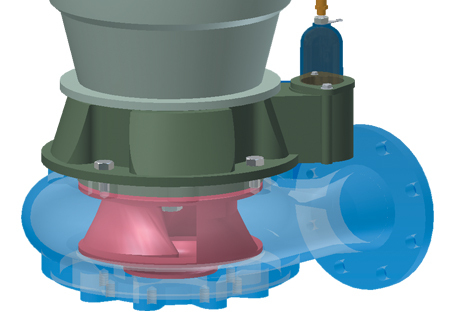 The X-PELLER® installs inside both vacuum primed and flooded suction Smith & Loveless pumps. It handles flows from 75 to 800 GPM (5 to 50 lps) for 4” (100 mm) pumps, 75 to 1,000 GPM (5 to 63 lps) for 6” (150 mm) pumps and 300 to 1,700 GPM (19 to 107 lps) for 8” (200 mm) pumps. We don't take shortcuts and we don't do gimicks.